LabSolutions Direct is a new remote access tool for the LabSolutions series that enables control and monitoring of HPLCs from a commercially-available smartphone or tablet PC via a simple user interface. LabSolutions Direct makes it possible to turn ON/OFF HPLC's solvent delivery unit or oven, start analysis, and monitor chromatograms. Thus, analysis can now be performed while checking instrument status from remote environments.LabSolutions Direct is a new remote access tool for the LabSolutions series that enables control and monitoring of HPLCs from a commercially-available smartphone or tablet PC via a simple user interface. LabSolutions Direct makes it possible to turn ON/OFF HPLC's solvent delivery unit or oven, start analysis, and monitor chromatograms. Thus, analysis can now be performed while checking instrument status from remote environments. 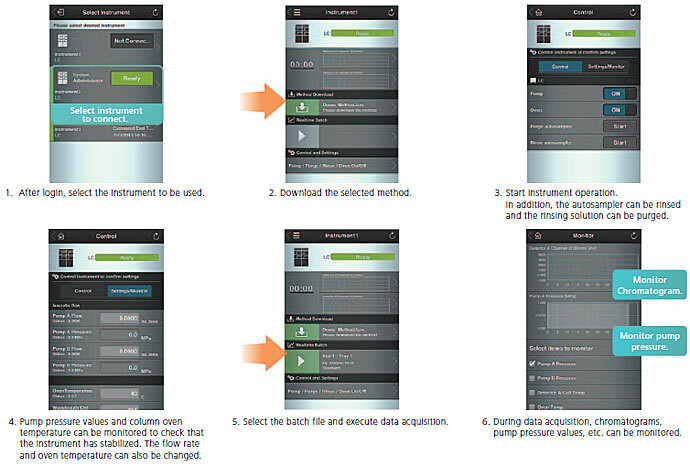 Directly access the HPLC in a laboratory from a smartphone or tablet PC. The HPLC connected to LabSolutions can be directly accessed from a commercially-available smartphone or tablet PC simply by adding on a wireless LAN router. This allows the instrument to be controlled and monitored from remote locations. LabSolutions Direct supports the series of analysis operations, including selecting methods used for analysis, turning ON/OFF the pump and column oven, data acquisition, and monitoring chromatograms or instrument status. No special software is required; the only thing needed is a Web browser. So, anybody can operate LabSolutions Direct with ease. LabSolutions Direct supports customers with visually easy-to-follow screens for the various operations, including the selection of methods, instrument control, data acquisition and monitoring of chromatograms. All of the functions required for remote operation are organized in an easy-to-follow manner on compact screens in such a way that they can be used with the same look and feel as smartphone or tablet PC applications. Method files or batch files created and managed on LabSolutions are read to LabSolutions Direct and executed to acquire data. The acquired data is automatically saved for a PC so it can be analyzed using LabSolutions. By connecting to LabSolutions, where methods, batch files and data are managed centrally, LabSolutions Direct provides a seamless remote access environment. * LabSolutions Direct supports control/monitoring of HPLCs in LabSolutions LC/GC.